The adoption of the Trade Facilitation Agreement (TFA) in December 2013 at the World Trade Organization’s (WTO’s) Ministerial Conference held in Bali, Indonesia, was a landmark achievement for the global trade community. The so-called ‘Bali Package’ marked an end to trade negotiations that had dragged on for over a decade. In a broader context the agreement breathed new life into the WTO’s style of multilateralism, which many had started to doubt due to the persistent deadlocks in trade negotiations experienced in previous years. One of the driving forces behind the TFA is its promise to deliver economic gains. The WTO has stressed that the simplification and harmonization of international trade procedures through the measures proposed under the TFA has the capacity to generate some 400 billion to 1 trillion US dollars to the world economy by reducing trade costs by around 10% to 15%, increasing trade flows and revenue collection, creating a stable business environment, and attracting foreign direct investment (FDI) [WTO, Day 3, 4 and 5: Round-the-clock Consultations produce ‘Bali Package,’ 5-7 December 2013]. The realization of these benefits would be fundamental to determining the TFA’s significance to the global trade community, and more broadly reaffirm the WTO’s capacity to deliver on global prosperity. With this in mind, I wrote a book, entitled ‘Single Windows and Trade Facilitation – A Tool for Development’, to investigate the economic value of single window systems recommended under Article 10 (4) of the TFA. 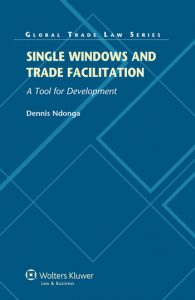 Single windows (SWs) have been one of the most controversial trade facilitation tools, owing to their high implementation costs. A number of developing countries have been lethargic about undertaking SW implementation, expressing scepticism about the ability of such systems to boost their global competitiveness. These sentiments were voiced in the negotiations leading up to the TFA. The common view is that the implementation costs of SWs far outweigh the presumed benefits, and many developing countries will be keen to discover whether the contentious provision will contribute to the agreement’s projected benefits. This book explores the economic benefits of SWs and further analyses some of the key challenges facing SW implementation in developing countries, with a view to offering direction to countries that are preparing to implement Article 10 (4) of the TFA. The book offers a detailed analysis of the concept of trade facilitation, with an emphasis on how the WTO deliberations on trade facilitation have developed from the first Ministerial Conference in Singapore up to the adoption of the TFA at the 9th Ministerial Conference in Bali. What are the various trade facilitation tools and programmes in operation? The book explores some of the global trade facilitation measures aimed at streamlining Customs and other border operations that have been proposed by various multilateral organizations such as the WTO, the World Customs Organisation (WCO), the United Nations Conference on Trade and Development (UNCTAD), and the United Nations Economic Commission for Europe (UNECE). How do single windows facilitate trade? The book examines the concept of SWs highlighting the diversity of SW models adopted in various jurisdictions, and the broad operational and revenue benefits that Customs and other international trade operators stand to gain from such systems. How would single windows interlink with national e-government initiatives? The book analyses the interrelationship between SWs and national e-government initiatives and how emerging economies can streamline their SW projects to achieve total e-service delivery by government, thereby realising some of the main economic benefits associated with e-government diffusion. How do single windows promote integrity in Customs administrations? The book examines the challenges of combating corruption in Customs, which has an adverse effect on economic growth. It presents detailed arguments supported by case studies on how the implementation of SWs can promote integrity in Customs and boost economic growth. How do single windows increase developing countries’ competitiveness in attracting FDI? The book analyses how SWs have the capacity to determine certain investment outcomes that are primarily linked to Customs efficiency, and thereby stimulate a country’s capacity to attract export-oriented investors. It further explores the economic benefits attached to export-oriented FDI. How can Customs overcome the major barriers to single window implementation? The book discusses some of the major barriers to SW implementation in developing countries. It analyses the technological and fiscal challenges affecting the implementation and operation of a SW in developing countries, and proposes practical solutions. It also explores the legal issues surrounding electronic authentication of international trade documents processed through SWs and recommends an appropriate legal framework to deal with these technicalities. In summary, the book serves to inform practitioners on the role of SWs in facilitating trade, and how the implementation of these systems can be appreciated as being more than a Customs modernization exercise, but also a development tool that can be integrated into a national development strategy. Dr Dennis Ndonga is a lecturer at Murdoch University, in Australia. He has carried out extensive research on single windows and trade facilitation. His findings have been published in a number of premier journals and presented at several WCO PICARD Conferences.